Keōpūolani (the gathering of the clouds of heaven) was the highest ranking chief of the ruling family in the kingdom during her lifetime. 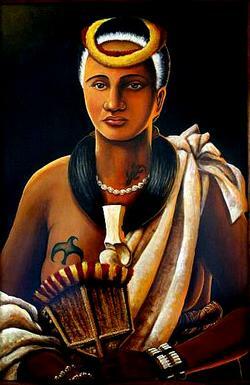 She was aliʻi kapu of nī‘aupi‘o (high-born – offspring of the marriage of a high-born brother and sister or half-brother and half-sister) rank, which she inherited from her mother, Keku‘iapoiwa Liliha and her father Kiwalaʻo. Her ancestors on her mother’s side were ruling chiefs of Maui; her ancestors on her father’s side were the ruling chiefs of the island of Hawai‘i. Keōpūolani’s genealogy traced back to Ulu, who descended from Hulihonua and Keakahulilani, the first man and woman created by the gods. Keōpūolani was reared under strict kapu because she was sacred; her kapu were equal to those of the gods. She possessed kapu moe, which meant that those who were in her presence had to prostrate themselves, face down, for it was forbidden to look at her. At certain seasons, no person was allowed to see her. In her childhood and early adulthood, she never walked out during daylight hours. The sun was not permitted to shine upon her, so she chose to be among people at night. Keōpūolani was with Kalola (her grandmother, Kiwala‘o’s mother) on the Island of Hawai‘i, when Kamehameha started his conquest to conquer the islands; victory at the battle of Moku‘ohai, there (with the death of Kiwalaʻo (Keōpūolani’s father,) was the start of Kamehameha’s rise to power. Kalola, her daughters and her granddaughter (Keōpūolani) fled to Maui, to take refuge with Kalola’s brother, Kahekili, and his son, Kalanikūpule. Then, Kamehameha stormed Maui with thousands of men, and after several battles Maui troops retreated to ʻIao Valley; Kamehameha was victorious there, too. Kalola escaped through the Olowalu Pass and down to Olowalu, where she retreated to Moloka’i. On the island of Molokaʻi Kalola became ill.
Kamehameha camped on Moloka‘i until Kalola died. This “capture” of the women by Kamehameha, a conquering chief taking the widow and female relatives of his defeated rival, was politically important. Keōpūolani usually resided with Kamehameha at Kailua-Kona. This, however, was not their constant dwelling place, although it was a favorite one. Aliʻi typically had multiple homes and divided their time between the different places of importance. Keōpūolani spent part of her time at Hawai‘i, part at Maui, part at Oʻahu and part at Kaua‘i. In 1797, she gave birth to a son, Liholiho. Kamehameha wanted Keōpūolani to go to Oʻahu, to Kūkaniloko, a famous birthing site and heiau (temple,) however, she was too ill to travel, and gave birth to their first-born child in Hilo. Kauikeaouli, her second son, was born in Keauhou, North Kona. She named him after her father, Kalanikauikeaouli Kiwalaʻo. The following year, her daughter, Nahi‘ena‘ena, was born. Kamehameha allowed Keōpūolani to have other husbands after she gave birth to his children, a practice common among ali‘i women (except Ka‘ahumanu.) Kalanimoku and Hoapili were her other husbands. Kamehameha I died in 1819, his son, Liholiho became King. Shortly after that, Ka‘ahumanu and Keōpūolani (wives of Kamehameha I) joined in convincing Liholiho to break the kapu system which had been the rigid code of Hawaiians for centuries. Liholiho accomplished this simply by eating a meal with women. When the Hawaiians saw that Liholiho was not struck down by angry gods, the entire kapu system was discarded. Likewise, the kapu moe ended at this time, as well. Missionaries then arrived in Hawai‘i in 1820. The Christian religion really caught on when High Chiefess Keōpūolani became interested and impressed with the Missionaries and the message they brought. Keōpūolani was spoken of “with admiration on account of her amiable temper and mild behavior,” said William Richards, a missionary in the islands. Keōpūolani is said to have been the first convert of the missionaries in the islands, receiving baptism from Rev. William Ellis in Lāhainā on September 16, 1823. She was ill and died shortly after her baptism. She was granted her request to be buried in a royal tomb, and lays in the Waiola Cemetery in Lāhainā, Maui. (Much of this information is from Mookini, “Keōpūolani, Sacred Wife, Queen Mother, 1778-1823.) In addition to this image, I have included some other images related to Keōpuōlani in a folder of like name in the Photos section on my Facebook page.